The brain and spinal cord make up the Central Nervous System (CNS). The term ‘central’ is used because it assimilates information from the whole body and coordinates activities across the entire organism. The brain is enclosed in and protected by the skull (cranial cavity). From the back of the brain, the spinal cord flows down, passing through the spinal canal and stopping down in the lumbar region. The brain and the spinal cord are protected by a triple layered membrane, this is known as ‘the meninges’. Sensory, connector and motor neurones. Like all living organisms, humans can respond to their environment. There are two control systems that work together to accomplish this – the nervous system and the hormonal (endocrine) system. Breathing, production of digestive enzymes, memory and intelligence are examples of things controlled by the human nervous system. The nervous system is composed of nerve cells, known as neurones. The details of each of the neurones can be seen in the images above. Each neurone has similarities and differences when it comes to length of fibres, location and their function. 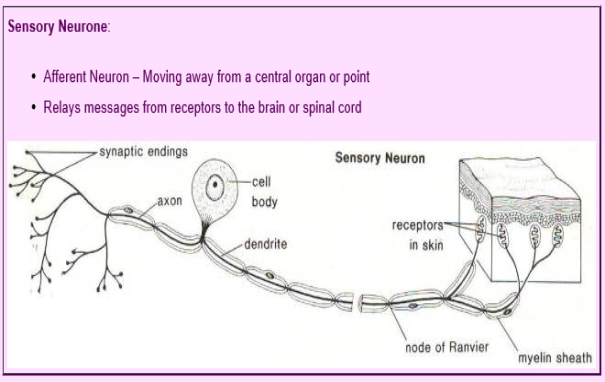 The Sensory neurone has long dendrites and short axons, is located within the cell body (dendrites outside of the cell body) and the cell body is located within the ‘dorsal root ganglion’. The function of the sensory neurone is to conduct impulse to the spinal cord. 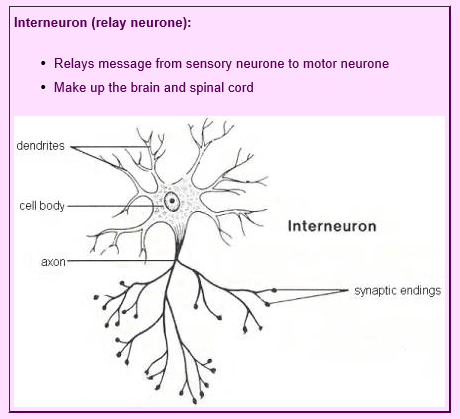 The interneuron has short dendrites and has either a short or long axon. It is located entirely within the spinal cord (central nervous system). Its function is to interconnect the sensory neuron with the motor neuron. The motor neuron has short dendrites and long axons. The dendrites and cell body are located within the spinal cord, whereas the axon is outside of the spinal cord. Its function is to conduct an impulse to the effector (gland or muscle). Axons and Dendrites the opposites of each other. Axons take information away from the cell body and Dendrites bring information to it. Axons have a smooth surface, Dendrites have a rough one. Only usually 1 Axon per cell, multiple Dendrites per cell. Axons have no Ribosomes, and Dendrites do. 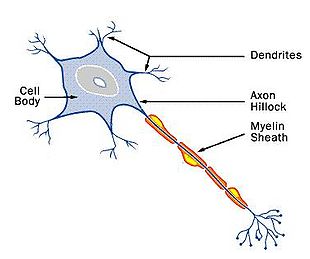 Axons can have Myelin insulation, Dendrites do not. Axons branch far away from the cell body, Dendrite branch closely to the cell. The ultimate function of nerve cells (neurones) is to transmit signal from sense organs, such as the eyes and skin, to the central nervous system – then from the CNS to the effector organs. An electrical current carries the neuron, which then transmits the signal. A fluid filled space known as a synaptic cleft separates two membranes. These are referred to as ‘pre’ and ‘post’ synaptic membranes. The above image shows the ‘pre’ and ‘post’ synaptic membranes. 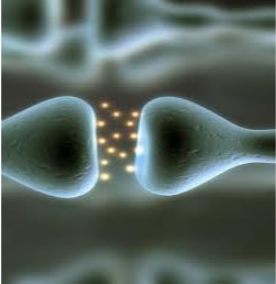 An electrical impulse comes from the axon of the pre-synaptic membrane. This in turn causes the nerve-ending of the neuron to release chemical messengers called ‘neurotransmitters’. The chemicals proceed to diffuse in the synaptic cleft, before binding with receptor molecules on the next neuron. They receptor molecules of this neuron will only bind with the specific chemicals given from the first neuron. This will then stimulate the next neuron to replicate the process. Voluntary actions require a message from the brain, before being able to carry it out. For this reason, they are slower than a reflex action. Most actions carried out by our body are voluntary actions, for example choosing to walk in a certain direct to avoid danger or obstacles. Reflex actions are in-voluntary and do not require thought in order to be processed. Reflex actions occur in response to a stimulus, for example when touching a hot surface, we automatically react by removing contact from the surface, before our brain actually recognises that the surface is hot. The inside of the body is controlled by the autonomic nervous system. Information is transported about the inside of the body to the central nervous system. It also controls internal organs such as our heart, stomach and liver etc. Homeostasis is where the body’s internal environment is maintained safely. This is done through balancing levels of temperature, oxygen in the blood, blood sugar and salt concentration. The autonomic nervous system is instrumental in ensuring homeostasis occurs in the body. Another vital role of the autonomic nervous system is displaying physical signs of our emotional expressions. An example of this is when we’re emotionally excited our heart rate may increase, blood pressure may rise, and our mouth may become dry. 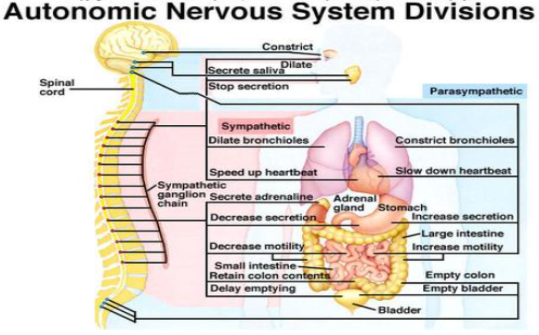 The autonomic nervous system has 2 divisions. The emergency system formally known as the Sympathetic division – and the housekeeping division known as the parasympathetic division. The parasympathetic division’s action is usually always the opposite of the Sympathetic division. The sympathetic division prepares our body to give out energy in order to protect itself from the effects of injury. The parasympathetic division will complete actions such as reducing heart rate and reduce blood pressure where necessary. Caffeine is known as a stimulant, caffeine can be found in coffee, cola, energy drinks, cannabis and amphetamines. Caffeine/stimulants increases the rate of transmissions of signals from one cell to another. This will increase our alertness, as well as our breathing and heart rate. Lon term affects include us producing ‘highs’ but these can also be followed by extreme ‘lows’. Extreme lows can progress further and lead to depression. Aviva.co.uk. (2017). Medical Encyclopedia – Function: Voluntary and Involuntary Responses – Aviva. [online] Available at: http://www.aviva.co.uk/health-insurance/home-of-health/medical-centre/medical-encyclopedia/entry/function-voluntary-and-involuntary-responses/ [Accessed 3 Feb. 2017]. Bbc.co.uk. (2017). BBC – GCSE Bitesize: How synapses work – Higher. [online] Available at: http://www.bbc.co.uk/schools/gcsebitesize/science/add_ocr_pre_2011/brain_mind/informationrev2.shtml [Accessed 3 Feb. 2017]. Bbc.co.uk. (2017). BBC – GCSE Bitesize: Stimulants, sedatives and painkillers. [online] Available at: http://www.bbc.co.uk/schools/gcsebitesize/science/edexcel_pre_2011/health/drugsandhealthrev4.shtml [Accessed 3 Feb. 2017]. Biologymad.com. (2017). Nervous System Intro. [online] Available at: http://www.biologymad.com/nervoussystem/nervoussystemintro.htm [Accessed 3 Feb. 2017]. Boundless. (2017). Synaptic Transmission. [online] Available at: https://www.boundless.com/biology/textbooks/boundless-biology-textbook/the-nervous-system-35/how-neurons-communicate-200/synaptic-transmission-763-11996/ [Accessed 3 Feb. 2017]. Indiana.edu. (2017). AUTONOMIC NERVOUS SYSTEM. [online] Available at: http://www.indiana.edu/~p1013447/dictionary/ans.htm [Accessed 3 Feb. 2017]. Newman, T. (2017). Central Nervous System: Structure, Functions and Diseases. [online] Medical News Today. Available at: http://www.medicalnewstoday.com/articles/307076.php [Accessed 3 Feb. 2017]. Science.education.nih.gov. (2017). The Brain-Lesson 3-Drugs Change the Way Neurons Communicate (Page 1 of 2). [online] Available at: https://science.education.nih.gov/supplements/nih2/addiction/guide/lesson3-1.html [Accessed 3 Feb. 2017]. Steane, R. (2017). Voluntary and reflex actions. [online] Biotopics.co.uk. Available at: http://www.biotopics.co.uk/newgcse/voluntaryReflex.html [Accessed 3 Feb. 2017]. The Student Room. (2017). Revision:Nerve impulse transmission – The Student Room. [online] Available at: https://www.thestudentroom.co.uk/wiki/Revision:Nerve_impulse_transmission [Accessed 3 Feb. 2017]. "The Central Nervous System: Structure and Functions." UKEssays.com. 11 2018. All Answers Ltd. 04 2019 <https://www.ukessays.com/essays/biology/structure-factors-central-nervous-2514.php?vref=1>. "The Central Nervous System: Structure and Functions." All Answers Ltd. ukessays.com, November 2018. Web. 26 April 2019. <https://www.ukessays.com/essays/biology/structure-factors-central-nervous-2514.php?vref=1>. UKEssays. November 2018. The Central Nervous System: Structure and Functions. [online]. Available from: https://www.ukessays.com/essays/biology/structure-factors-central-nervous-2514.php?vref=1 [Accessed 26 April 2019]. UKEssays. The Central Nervous System: Structure and Functions [Internet]. November 2018. [Accessed 26 April 2019]; Available from: https://www.ukessays.com/essays/biology/structure-factors-central-nervous-2514.php?vref=1.